As a bonus, here is Dana and me at a Holloween party a few months before the Christmas card. We were putting Rolos on our teeth and talking in British accents. As a Super Bonus, here is Miss Sally wearing the Superman costume that I wore this year (with Super Extra Bonus Top and Bottom Comparison) That is also John as The Hulk. 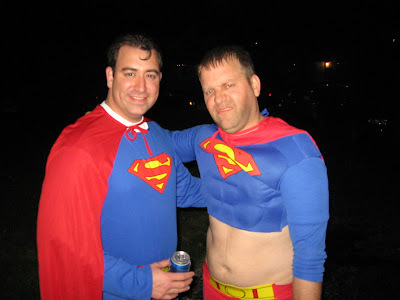 So THAT'S what Superman would look like if he were old, blonde & drank too much beer. 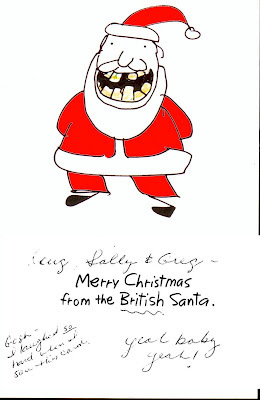 I wish you a merry xmas and thanks for the chuckle you have given me for xmas. I think I may be moving to Chicago soon, job relocation. I just sent my wife and daughter back to Russia today, they should be back in 6 months. I would love to truck over to Ohio and buy you a brew.